DYNAMIC FORCES® - SECRET WARS BATTLEWORLD #1 SIGNED BY JOSH WILLIAMSON! 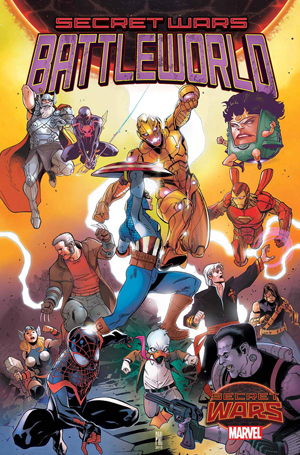 When the Marvel Universe and the Ultimate Universe collide, there is only...Battleworld! Featuring the fights, battles and blow-ups that are just TOO BIG for Secret Wars! When a Dr. Strange-possessed Punisher goes on the run, only Spider-Man, Wolverine, Hulk and Ghost Rider can track him down! Question: What happens when M.O.D.O.K. recruits every single M.O.D.O.K. ever for his evil schemes? Answer: M.O.D.O.K. M.A.D.N.E.S.S. ***FINAL COVER ART MAY VARY! ***! SECRET WARS BATTLEWORLD #1 ACTION FIGURE VARIANT!